For other uses, see Daikon (disambiguation). Daikon (大根, literally "big root"), also known by many other names depending on context, is a mild-flavored winter radish (Raphanus sativus variety (cultivar) 'Longipinnatus') usually characterized by fast-growing leaves and a long, white, napiform root. Originally native to Southeast or continental East Asia, daikon is harvested and consumed throughout the region, as well as in South Asia. In culinary contexts, daikon or daikon radish (from its Japanese name) is the most common in all forms of English, although luóbo is increasingly familiar due to Chinese immigration. Historical ties to South Asia permit mooli (from its Hindi/Panjabi name and also in Urdu) as a general synonym in British English. The generic terms white radish, winter radish, Oriental radish, long white radish, and other terms are also used. Other synonyms usually vary by region or describe regional varieties of the vegetable. When it is necessary to distinguish the usual Japanese form from others, it is sometimes known as Japanese radish or "true daikon". The vegetable's Mandarin names are still uncommon in English; in most forms of Chinese cuisine, it is usually known as luóbo, Chinese white radish, although in Cantonese and Malaysian cuisine, it is encountered as lobak or lo pak, which are Cantonese pronunciations of the general Chinese term for radish and carrot (萝卜). In the cuisines of Hokkien-speaking areas such as Singapore and Taiwan, it is also known as chai tow or chai tau (菜头). In any of these, it may also simply be referred to as radish, with the regional variety implied by context. In English-speaking countries, it is also sometimes marketed as icicle radish. In mainland China and Singapore, the calque white carrot or misnomer carrot is sometimes used, owing to the similarity of the vegetables' names in Mandarin and Hokkien. This variant gave the title to a popular guidebook on Singaporean street food, There's No Carrot in Carrot Cake, which refers to chai tow kway, a kind of cake made from daikon. In North America, it is primarily grown not for food, but as a fallow crop, with the roots left unharvested to prevent soil compaction and the leaves (if harvested) used as animal fodder. The official general name used by the United States Department of Agriculture is oilseed radish, but this is only used in nonculinary contexts. 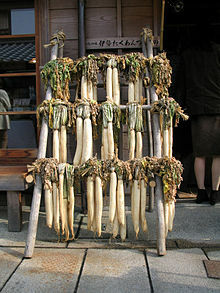 Other English terms employed when daikon is being used as animal feed or as a soil ripper are forage radish, fodder radish, and tillage radish. A number of nonwhite varieties occur. The Cantonese lobak, lo pak, etc. sometimes refer to the usual Chinese form, but is also applied to a form of daikon with light green coloration of the top area of the root around the leaves. The Korean radish, also called mu, has similar pale green shade halfway down from the top, and are generally shorter, stouter, and sturdier, with denser flesh and softer leaves. Both are often spicier than the long white radishes. 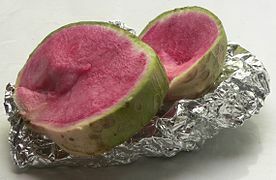 The heirloom watermelon radish is another Chinese variety of daikon with a dull green exterior, but a bright rose or fuchsia-colored center. Its Chinese name (t 心裡美蘿蔔, s 心里美萝卜, xīnlǐměi luóbó) is sometimes irregularly romanized as the shinrimei radish and sometimes translated as the beauty heart, beautiful heart inside, or roseheart radish. The Chinese and Indian varieties tolerate higher temperatures than the Japanese one. These varieties grow well at lower elevations in East Africa. If moisture is abundant, it can grow quickly; otherwise, the flesh becomes overly tough and pungent. The variety Long White Icicle is available as seed in Britain, and will grow very successfully in Southern England, producing roots resembling a parsnip by midsummer in good garden soil in an average year. Certain varieties of daikon can be grown as a winter cover crop and green manure. These varieties are often named "tillage radish" because it makes a huge, penetrating root which effectively performs deep cultivation. They bring nutrients lower in the soil profile up into the higher reaches, and are good nutrient scavengers, so they are good partners with legumes instead of grasses; if harsh winters occur, the root will decompose while in the soil, in the spring releasing early nitrogen stores. In Japan, many types of pickles are made with daikon, including takuan and bettarazuke. Daikon is also frequently used grated and mixed into ponzu, a soy sauce and citrus juice condiment. Simmered dishes are also popular such as oden. Daikon that has been shredded and dried (a common method of preserving food in Japan) is called kiriboshi-daikon (literally, "cut-dried daikon"). Daikon radish sprouts (kaiware-daikon) are used for salad or garnishing sashimi. Daikon leaf is frequently eaten as a green vegetable. Pickling and stir frying are common. The daikon leaf is part of the Festival of Seven Herbs, called suzushiro. In Chinese cuisine, turnip cake and chai tow kway are made with daikon. 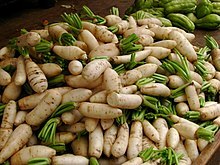 The variety called mooli has a high water content, and some cookbooks recommend salting (or sweetening, depending on the region and context) and draining it before it is cooked. Sometimes, mooli is used to carve elaborate garnishes. More commonly, daikon is referred as bailuobo (白蘿蔔) in Mandarin or lobak in Cantonese. Bailuobo is used in a variety of dishes for its unique and mild flavour after being boiled and cooked. For soups, bailuobo can be seen in bailuobo-paigu soup (白蘿蔔排骨湯), bailuobo-fanqie soup (白蘿蔔番茄湯), etc. Delicacies such as "shredded bailuobo" (白蘿蔔絲) and "cut bailuobo" (白蘿蔔塊) are popular domestic dishes too. Similar to Japanese cuisine, there are many types of pickles (in Mandarin Chinese: 咸菜 xiáncài / 榨菜 zhàcài) made with bailuobo, for example "sour-sweet cut bailuobo" (酸甜白蘿蔔塊), "Spicy bailuobo" (麻辣白蘿蔔), "bailuobo zhacai" (白蘿蔔榨菜), etc. In the Philippines, the sour stew sinigang may include daikon. In Pakistani cuisine, the young leaves of the daikon plant are boiled and flash fried with a mixture of heated oil, garlic, ginger, red chili, and a variety of spices. The radish is eaten as a fresh salad often seasoned with either salt and pepper or chaat masala. In Bangladesh, fresh daikon is often finely grated and mixed with fresh chilli, coriander, flaked steamed fish, lime juice and salt. This light, refreshing preparation served alongside meals is known as mulo bhorta. In North India, daikon is a popular ingredient used to make sabzi, stuffed paranthas, pakodas, salads, pickles and as garnish. The plant's leaves are used to make dal and kadhi, among other dishes. In South India, daikon is the principal ingredient in a variety of sambar, in which roundels of the radish are boiled with onions, tamarind pulp, lentils, and a special spice powder. When cooked, it can release a very strong odor. This soup, called mullangi sambar (Tamil: முள்ளங்கி சாம்பார், Kannada: ಮೂಲಂಗಿ ಸಾಂಬಾರ್; literally, "radish sambar") is very popular and mixed with cooked rice to make a good meal. Fermenting radish normally releases a strong and noxious smell like bad farts or rotting cabbage. Daikon is very low in food energy. A 100-gram serving contains only 76 kilojoules or 18 Calories (5 Cal/oz), but provides 27% of the RDA for vitamin C. Daikon also contains the active enzyme myrosinase. Tillage radish leaves behind a cavity in the soil when the large tap root decays, making it easier for the following year's crops, such as potatoes, to bore deeper into the soil. Potatoes grown in a rotation with tillage radish do not experience growth restrictions associated with having a shallow hardpan, as the tillage radish can break the hardpan, and makes transfer of water, and other important nutrients, much easier for the rooting system. Nutrient retention is another important feature of tillage radish. The large tap root is designed to retain macro- and micro-nutrients, that would otherwise have the potential to be lost to leaching during the time when the field would otherwise be left empty. The nutrients from the root become readily available for the following year's crop upon the decay of the radish, which can boost yields, and reduce fertilizer costs. Dr. Robert Coffin, a potato industry consultant on Prince Edward Island, suggests that growing tillage radish could help boost potato yields, because of the effect that the large tap root that grows 6–10 inches has on mitigating the soil compaction. This makes it much easier for potatoes to grow to their full potential, and not be held back because of compaction issues in the soil. Daikon is used in preparing metal surfaces for chemical patination, for example under the Rokushō process. ^ a b Larkcom, Joy; Douglass, Elizabeth (1994). Oriental Vegetables: The Complete Guide for the Gardening Cook. Oxford University Press US. pp. 114–115. ISBN 1-56836-017-7. ^ Oxford English Dictionary, 3rd ed. "mooli", n." Oxford University Press (Oxford), 2002. ^ The Oxford English Dictionary, for instance, provides an entry for mooli, and only mentions daikon as its synonym in Japanese contexts. ^ Larkcom and Douglass divide the term "oriental radish" into two categories, which they label "white mooli types" and "coloured types". ^ a b Robert Bailey Thomas. The Old Farmer's Almanac. p. 28. ^ "Raphanus sativus L. (Longipinnatus Group)". MULTILINGUAL MULTISCRIPT PLANT NAME DATABASE. ^ Ruth Wan; Roger Hiew (2010). There's No Carrot in Carrot Cake: 101 Hawker Dishes Singaporeans Love. Epigram Books. ISBN 978-981-08-2865-3. Retrieved 5 April 2013. ^ a b Natural Resources Conservation Service. PLANTS Database. "Plant Fact Sheet: Oilseed Radish, Raphanus sativus L.". United States Dep't of Agriculture, 2012. Accessed 22 June 2014. ^ Natural Resources Conservation Service. PLANTS Database. "Plant Guide: Oilseed Radish, Raphanus sativus L.". United States Dep't of Agriculture, 2012. Accessed 22 June 2014. ^ Grubben, G.J.H. (2004). Vegetables. PROTA. ISBN 978-90-5782-147-9. ^ Doeser, Linda (2010). The Ultimate Chinese Cookbook. Hermes House. p. 9. ISBN 1843093421. ^ "How to combat odor from picked radishes". Retrieved 2018-07-30. ^ a b "Tillage radish cover crop - tips to maximize its benefits". deltafarmpress.com. Retrieved 2016-12-01. ^ "Tillage radishes". www.agannex.com. Retrieved 2016-12-02. Wikimedia Commons has media related to Raphanus sativus var. longipinnatus. This page was last edited on 22 April 2019, at 08:47 (UTC).